One of the children asked us many times if we might try cooking the corn. We asked them how we should cook it. After a bit of thinking, they decided that their mom makes corn in the oven. We weren’t sure where this experiment might lead, but we thought it was certainly an interesting prospect. The temperature and baking time were suggested by the experimenting student. These cooked quietly in the science lab while we finished our choice time in the classroom. The children helped us set a timer so we wouldn’t forget to pull them out of the oven. Two students watched the timer carefully for the last 9 minutes. When Miss. Davis brought them in, the pan was still hot. We noticed they didn’t look too different. We did, however, decide that we should keep them separate from the other corn so we could compare them. One child suggested making a label and another wrote it out for us. 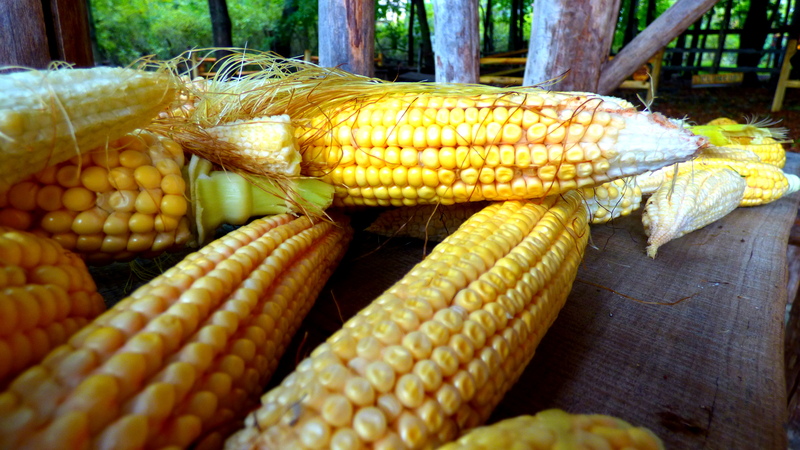 Once we looked a bit closer, we could see some differences between the cooked and uncooked corn. What do you notice? 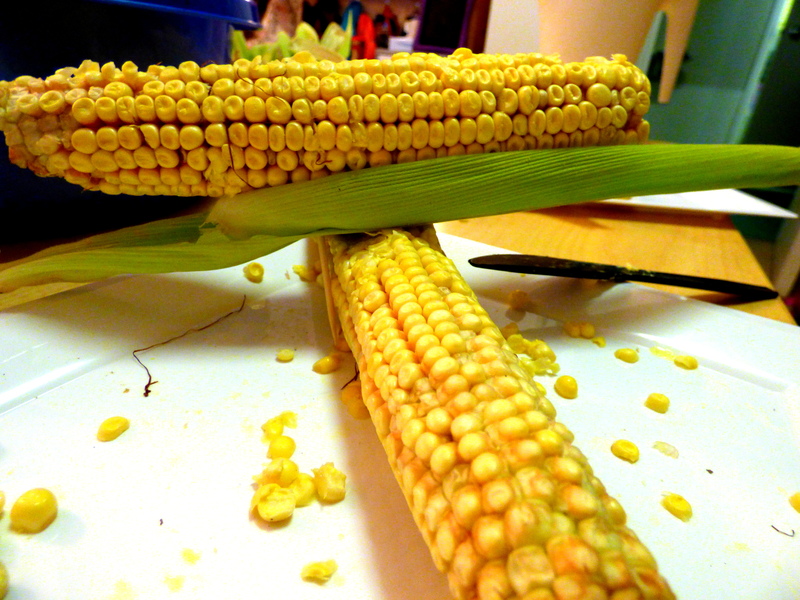 With our haul of freshly shucked corn, we headed indoors to see what uses we might find. Although I cannot say which (I’m sworn to secrecy), one of the children already tasted the cobs and found them wanting. Edibility out of the question, what DO you do with a large batch of corn ears? How about [butter] knife handling skills? Everyone needs more practice cutting up their own food. We wondered what strategies the children would use when given this common tool. 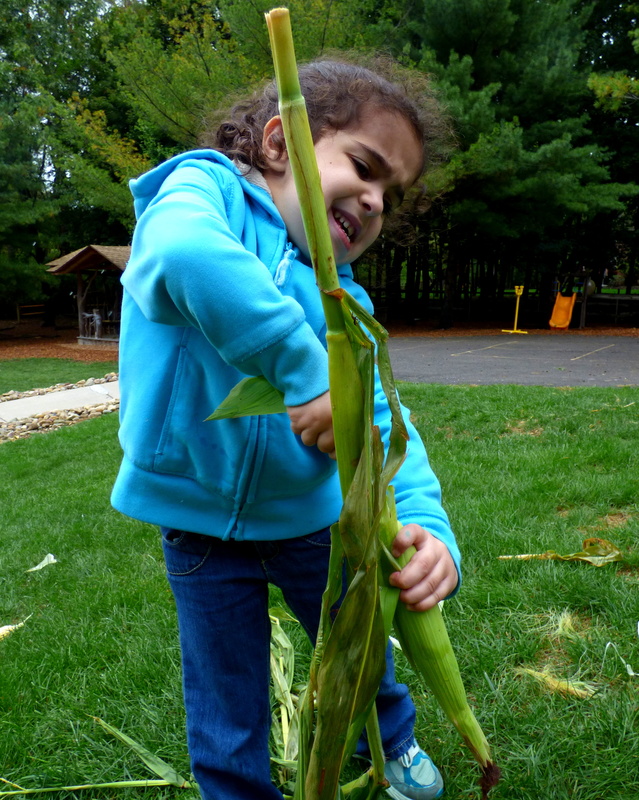 We witnessed sawing, attempts at slicing and valiant efforts to hack the corn to pieces. Of course, there’s painting. I mean, it IS pre-kindergarten. Add a bit of science experimentation, two colors of paint and some ears of corn and you get instant fun with secret learning. 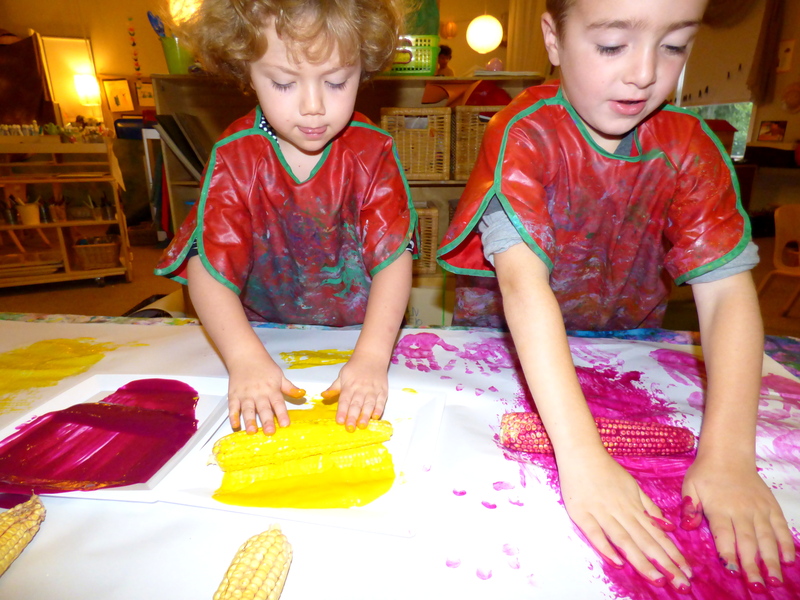 We saw patterns, comparisons and new language to describe the wet corn and the paint. A few of the children quickly dispensed with the corn and dove right in and began drawing and mixing with their fingers. Finally, we had a few students who chose not to use the paint at all. Rather, they went for a more sculptural approach. Available husk pieces were tied around corn, used for “bedding” and added as shims to hold more vertical structures. The decorations from Applefest made a comeback this week. 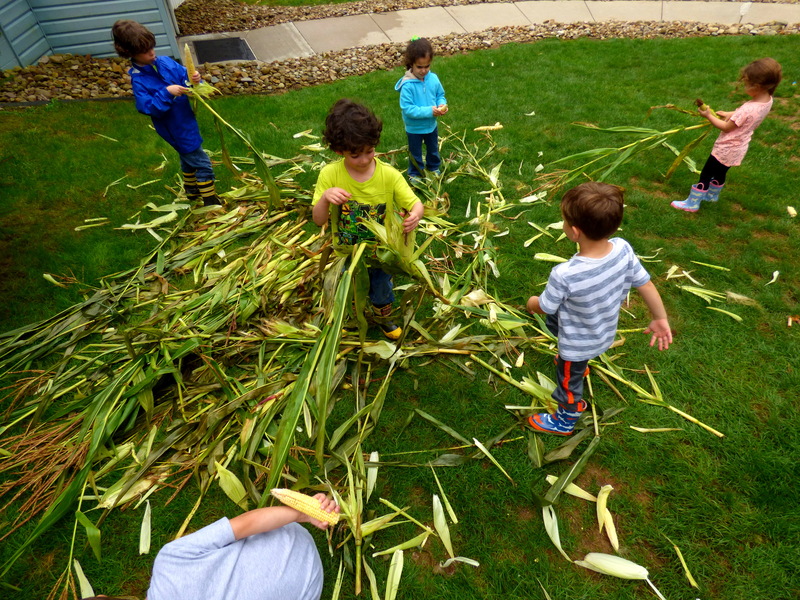 Our hard-working custodial staff gathered up all of the corn stalks from the festival and prepared them for final transportation to the dumpster or compost pile. (Un?? )Fortunately, our class found the pile first. One child knew right away what treasure lay buried within the stiff green layers. 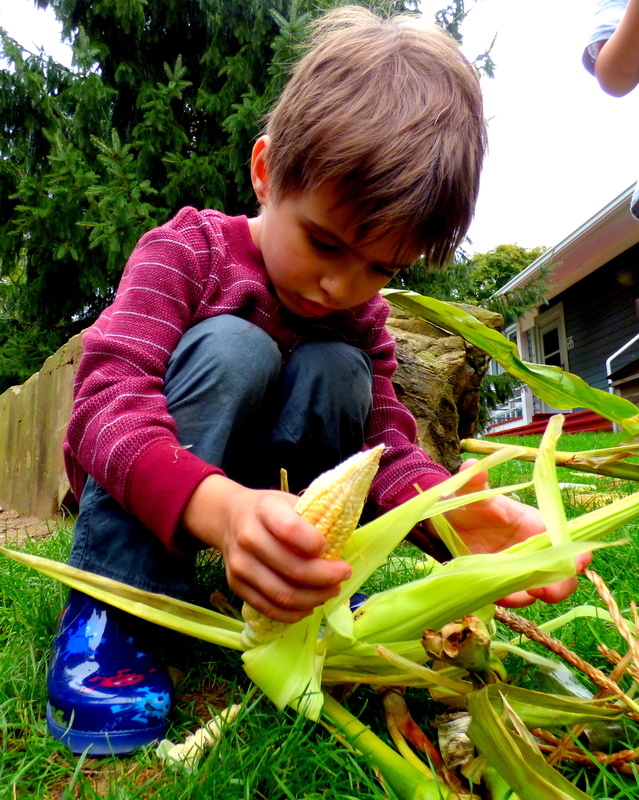 Once corn was officially discovered, husking (or “shucking” as Mrs. Forst says) became the activity of choice. Yet, they never gave up. And the reward was worth it. As always, persistence pays off.